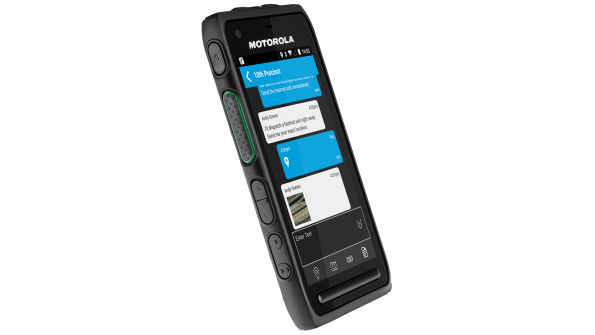 Motorola Solutions launches the LEX L11, the company’s new rugged LTE smartphone that is designed for public-safety use on FirstNet or other global networks while enabling integrated communications with a P25 system. ORLANDO—Motorola Solutions today announced the LEX L11, the company’s new rugged LTE smartphone that is designed for public-safety use on FirstNet or other global networks while enabling integrated communications with a P25 system. Les Miller, Motorola Solutions’ North America commercial markets and launch marketing manager, said the LEX L11 builds upon the foundation of LEX L10, which was the company’s first public-safety LTE smartphone. “We’re providing mission-critical, public-safety capabilities in a device that—to the casual observer—looks like a typical mobile device,” Miller said during an interview with IWCE’s Urgent Communications. “There are certainly a lot of ruggedized smartphones out there that are being used by agencies, but—more often than not—they look like ruggedized smartphones. You don’t have to look very closely to recognize that that huge bulky thing that the officer is carrying … is something that is not your average, run-of-the-mill device. Some notable public-safety features in the LEX L11 are a large push-to-talk button on the side, an emergency button on top and two programmable buttons, Miller said. The LEX L11 will support operation on the Band 14 spectrum licensed to FirstNet. Internally, the LEX L11 features a faster processor, more memory, better screen resolution and a better camera than the LEX L10, Miller said. From a durability perspective, the LEX L11 is IP67 rated and utilizes Gorilla Glass 3, he said. In addition, the LTE smartphone can be linked with an LMR radio to enable communications on an LMR system via the LEX L11, Miller said. A toggle switch on top of the LEX L11 lets the user choose radio channels on a paired APX portable radio, and the LEX L11 also allows volume control of the P25communications through the LTE device, he said. “One of the things I think will be great from a usability perspective is that there’s a toggle switch built into the top of the phone,” Miller said. “You can actually toggle radio channels from the top of your mobile device. This attribute could be especially helpful to public-safety users operating in situations where discretion is advisable, Miller said. “If you’ve got an officer on the streets with this LEX L11 that looks just like another smartphone, and they’ve got an APX 3000 [covert P25 portable radio] in the backpack that they’re carrying, they can be communicating with somebody—from a mission-critical perspective—without having to have that radio in their hands,” he said. Although the LEX L11 was designed to serve public safety, Motorola Solutions officials believe sectors such as manufacturing, oil/gas, utilities and mining will express interest in using the device, Miller said. Motorola Solutions launched the LEX L11 today and plans to begin shipping the device in July, Miller said. The LEX L11 will be displayed in Booth 2539 in the IWCE 2018 exhibit hall today and tomorrow.